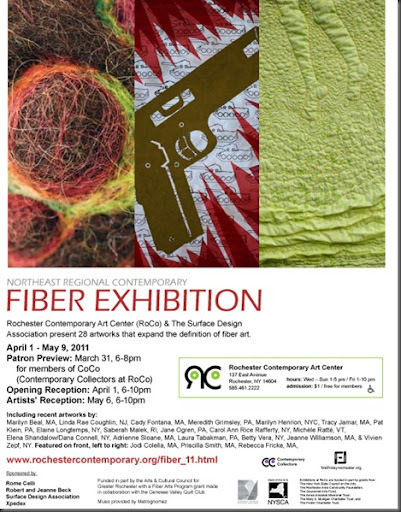 The Northeast Juried Contemporary Fiber Exhibition at Rochester Contemporary Art Center, 137 East Avenue, Rochester, NY, presents 28 works by 22 artists that expand the definition of fiber art. The participating SDA artists from NYS are: Marilyn Henrion, Tracy Jamar, Elaine Longtemps, Carol Ann Rice Rafferty, Elena Shandalow/Dana Connell, Betty Vera and Vivien Zepf. 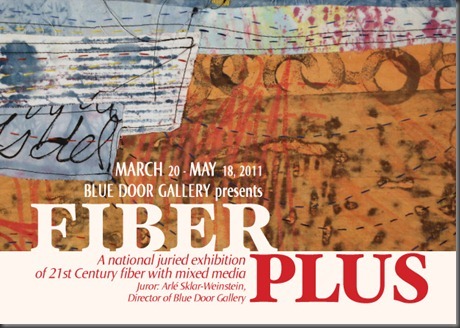 Fiberart International also opens at the Memorial Art Gallery on May 1, so if you are interested in visiting both venues, you’ll want to time a visit to Rochester between May 1 – 9 and enjoy two intriguing exhibitions of contemporary fiber. 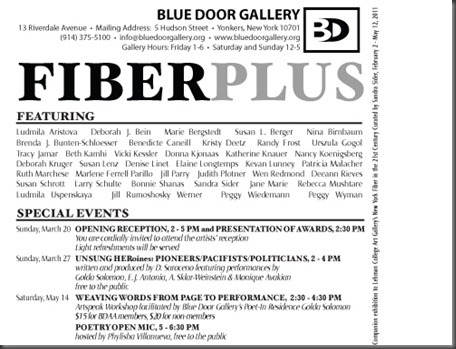 Deborah Bein’s piece, “You’re Fracking Killing Me” has been selected for the Fiber Plus juried exhibition at the Blue Door Gallery, 13 Riverdale Avenue, Yonkers, NY. 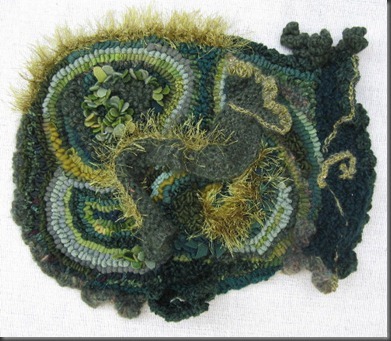 Tracy Jamar, “Moss” 2010, approximately 13″ x 15″ x 1.5″, wool, cotton and mixed fiber in fabric and yarn; hand hooked, knit, crocheted and embroidered on Monk’s cloth. 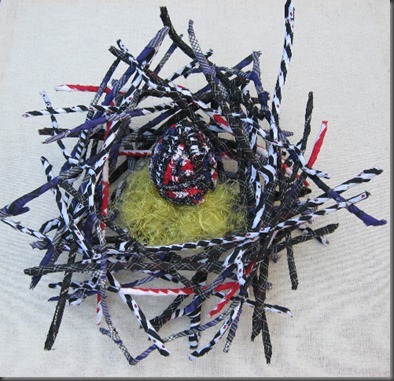 Tracy Jamar, “Nest” (Mutation/Adaptation?) 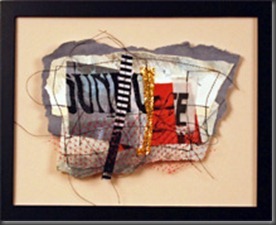 2010 approximately 24″ x 21″ x 11″ cotton fabric, sticks, wire, micro fiber. Commenting on the effect modern production has on nature. 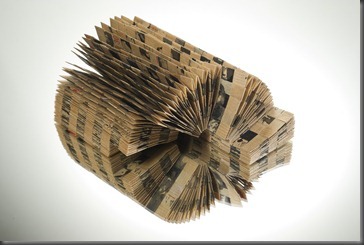 Bajus has two works in Overabundance of Detail show at Burchfield Penney Art Center in Buffalo. Overabundance of Detail focuses on artists who create intricate aesthetic experiences by focusing on minute variations and fluctuations in content and form. A commitment to detail borders on obsession in some works; while in others, it reveals to us the unique nature of the objects presented. Large-scale pieces can entice from afar with rich patterns, examined closely they reveal precision. 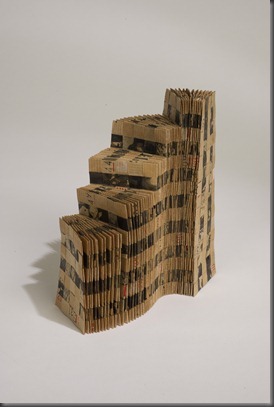 Smaller works, because of their tooling or architectural reference points, seem monumental. Works as varied as paintings, drawings, metal sculpture, and cake designs will illustrate different artist’s use of extreme detail work. Turan’s art represents the vibrancy of shape, line and color that makes up a city. Steel, stone, concrete and glass designed and engineered at its most functional, abstract and forceful. 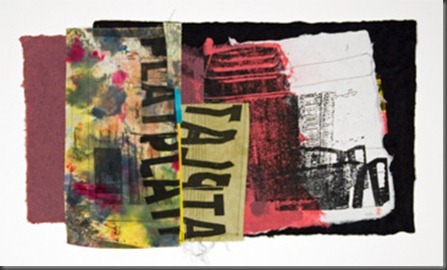 Her mixed-media fiber pieces are works in dyes, threads and a variety of other media on whole cloth that give the impressions of the hardness of the city but in the malleable surface of textiles. Jappie King Black’s “Small Wall Collection”, above is one of three pieces on exhibit at the Uncommon Threads show at Artworks in Trenton, NJ, March 12 – April 16, 2011. Jappie King Black, Platter, bronze. 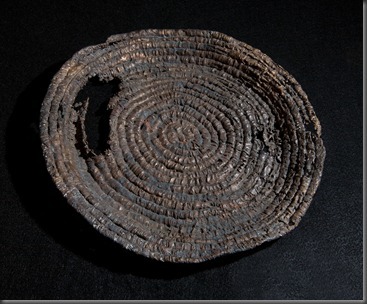 The artist also has three bronze baskets in Cast II an exhibit at Index in Newark, New Jersey. 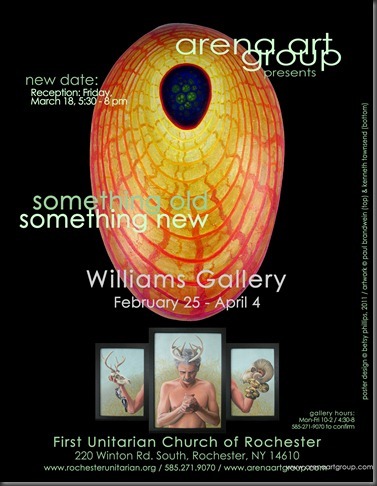 Jeanne is participating in “Something Old, Something New” as part of the Arena Art Group. The opening reception will be at Williams Gallery, First Unitarian Church of Rochester, 220 Winton Road South, Rochester, NY, on Friday, March 18, 5:30 – 8:00 PM. Dates: February 25 – April 4. 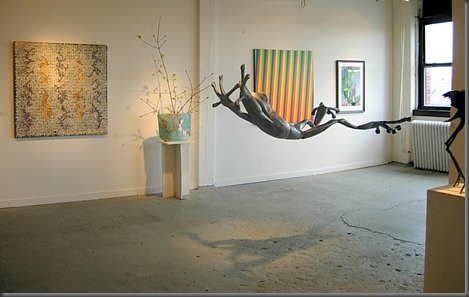 Jeanne’s “Pages 7” , above left, is one of the works in the Hungerford Urban Artisan’s “Flux” exhibition in Room 258, Hungerford Building, 1115 East Main St., Rochester, NY. 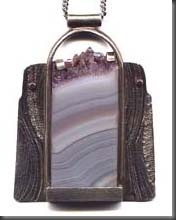 The Hungerford Urban Artisans are participating in the Western New York area “Thaw” gallery events. 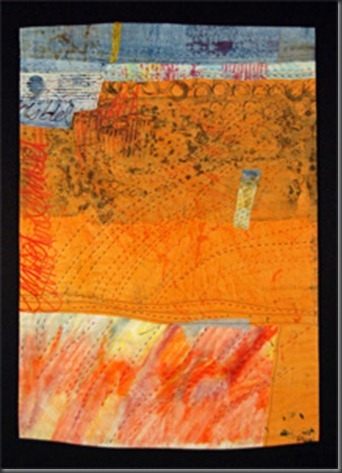 Reception: Mar 5 from 5-8. Vered Sivan. The public is invited to attend. 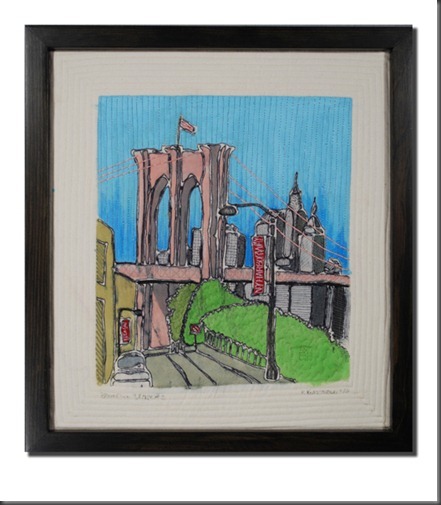 New York Fiber in the 21st Century focuses on artists in and near New York City who work primarily in fiber/textile materials or modes, including quilt-making, knitting, crochet, tapestry, weaving, felt making, rug hooking, embroidery, needlepoint, basketry, book arts, and metal work. 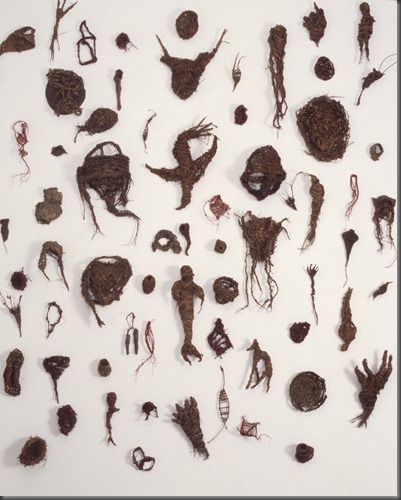 This exhibition offers a unique survey and features emerging artists beginning to make a name for themselves, as well as mature artists whose work was recognized in the first major wave of New York fiber art in the 60s and 70s. All of the works were produced since 2001, and four artists – Gema Alava, Lisa Curran, Don Porcella, and Vered Sivan – have created large-scale installations for the exhibition. 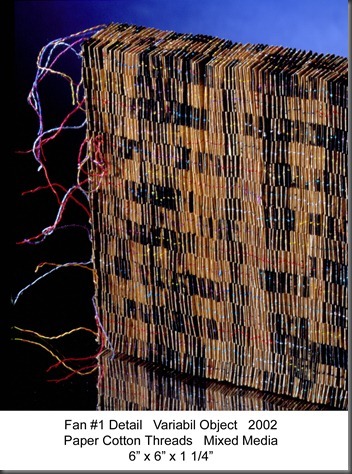 This survey includes forty-seven works by thirty artists and demonstrates the vibrant diversity of fiber art on the New York scene. Ros Aylmer, an SDA member from Vancouver, Canada is traveling to NYC in April with some textile and Surface Design enthusiasts, and is wondering if our Manhattan based members have any suggestions for them while they’re in town. Their primary focus is on one-of-a-kind clothing design. They will be visiting museums as well as the garment district and as many fashion designers as possible. If you know of any textile related shows or studios they might visit, please send Ros an e-mail at rosaqed@shaw.ca. I’m sure she would greatly appreciate it. Karen in her SF Bay Area studio, upper left, holding a white bottle. Available at Rockwell Hall Box office’s on Buffalo State College Campus, Please call 716-878-3005 or visit. Doors open at 7:00pm, join us during the “high fashion red carpet pre-show party”…cash bar, DJ, New Era Photo booth, Raffle, Art Exhibitions and much more. ALL PROCEEDS GO TO THE FASHION TECHNOLOGY SCHOLARSHIP FUND! For VIP tickets call 716-878-6018, starting March 1st. Any SDA members that purchase tickets for the evening event at Wegmans need to register their name with Elaine Pulvanen at epcad@oradrunner.com to get a reserved seat with their name on it and entrance into the evening VIP reception.